So let’s consider for a moment what a modeled 808 from Roland would look like, at least while we wait to talk to them about specifics. The results are very, very good, perhaps not exceeding what’s possible with big sample banks on computers, but certainly a leap forward in playability and expression for dedicated Roland hardware. These reviews take on new relevance as you can take what they say about the sound design for keyboards and apply it here to drum machines. I was corrected by a reader that just because SuperNATURAL is described as “virtual analog” doesn’t mean there’s necessarily a model of a waveform; these oscillators may use PCM sample sources and a combination of layering and other component models to get the desired sound. I am hopeful that what we’ll see on the Aira is a new architecture that is truly virtual analog. I think if Roland can hit an affordable price with this, and if it’s reasonably playable, they’ll have a hit on their hands. And the form factor has a reasonably-nice layout, with big triggers. The big question if it’s modeled digitally: will it breathe like a real TR-808? 1. You see, the capacitors for the VCAs don’t always fully discharge before the instrument is next triggered which creates a kind of pumping effect. Also, the original clap circuit was poorly designed and you usually can’t hear the clap reverb on the first couple hits. Will they mimic this? 2. Some of the oscillators are free-running, meaning that the beginning of the waveform can differ each time the hats, cymbals and cowbell are triggered. Also, the kick drum uses a bridged T-resonator circuit – a fundamentally unstable analog arrangement where the trigger pings/excites the circuit which bursts into resonance then slowly fades. It’s a beautiful, natural & organic-sounding sound. Will this be emulated? 3. There are also many audible variations between drum hits due to the trigger circuits. Not only that, seeing as most of the original components have 5-20% tolerances, temperature changes create variations in the sound. I don’t imagine these are important to Roland. Nor should they be important to someone who just wants a drum machine. They are important to people whose attraction to the 808 is to a specific instrument. The Aira, as Roland is already saying, is something new. 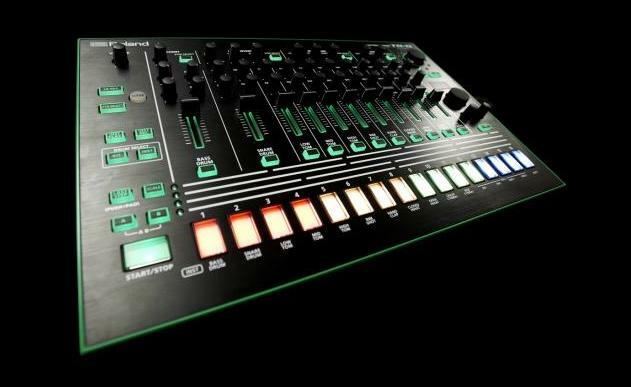 Roland Aira TR-08: Remix, Not a Reissue, of 808 – But What Does That Mean?